29 years old, graduated in computer engineering in Ferrara two years ago, Giuseppe Cancelliere defines himself as a mix between a systems programmer, who takes care of the architectural aspect, and a data analyst. “Undoubtedly – he explains – my job is to do all the technical steps required to read and correctly analyze Big Data”. Joining Engineering on graduation with a great passion for Artificial Intelligence and Analytics, he believes that his main goal is to “simplify the life of those who analyze data. I deal with the technical aspects, I am a certified developer of the Apache Spark distributed computing frameworks, I offer support to colleagues who deal with data analysis by also optimizing the architectural resources useful to carry out this operation better”. 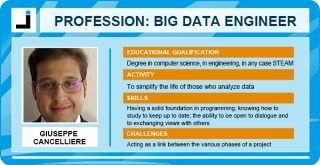 How is a Big Data Engineer’s working day structured? “I spend most of my time writing code and monitoring dashboards which allow me to know whether the work we’re doing is going in the right direction or not. Teamwork is certainly important: you never work alone, you share a lot with your colleagues, we discuss things, including remotely, between different locations thanks to videoconferencing. An important part of the work is what I do once I get home, when I study the many innovations which are typical of the sector I deal with. Every article, book, exchange of information in specialized communities is an opportunity for professional growth”. “The most complex thing is putting together different ways of seeing data analysis: on the one hand, we have analysts who need to have results quickly, on the other there are administrators who focus more on the quality of what has to go into production. Putting together the visions of professionals who have completely different backgrounds is not always simple”. What’s cool about being a Big Data Engineer? “As I have been passionate about developing distributed systems since university, I feel mine can only be a biased answer. Given this, my work is really very engaging and interesting and above all, it is never boring and repetitive. A figure like mine works transversally on different projects, not just on one, and in this way my intervention is “when needed”, to then leave the project in the hands of others. I like this because it allows me to get to know various activities and environments and to come up against different problems”. What is the relationship within the company between women and men who hold technical roles like yours? “I must say that, contrary to normal expectation, our working group is really well balanced between men and women. There are several women colleagues who deal with both architectural aspects and data analysis. My technical supervisor is a woman. It’s very easy to work with mixed groups”. What training is required for this job? “Although I attended a high school for scientific studies, I only began planning things once I began university: during those years I learned everything, then passion did the rest. Taking computer engineering, with a specialization in automation and distributed systems, certainly pointed me in the right direction”. What characteristics do you think a person should have to do this job? “I believe that a solid foundation in programming, both from an architectural and engineering perspective, is necessary. If to this you also add a passion for problems concerning the analysis of large amounts of data, then everything is easier. From the point of view of character traits, since I am a connecting figure of sorts, it is certainly necessary to be open to dialogue and to exchanging views with others”. “Neuromancer” by William Gibson. It dates back to 1997, but it gives a vision of the digital future and of humanity which challenges our imagination”.